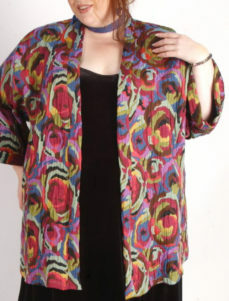 Special Occasion Formal Kimono Jacket Black Grey Abstract Silk Sizes 14 - 36: Lightweight and supple, this 3/4 Length Kimono is created from a unique French couture black silk georgette burnout abstract fully lined with pale green rayon satin. 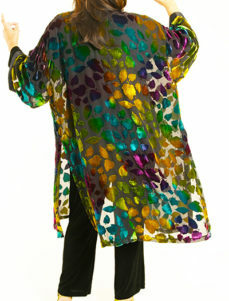 The subtle grey green lining gives a wonderful iridescence to the fabric! The front band and sleeves bands are of black rayon satin. We show it here over a grey silk crepe Tank Dress, giving yet another subtle tone to the mix. Price here is for the jacket only. 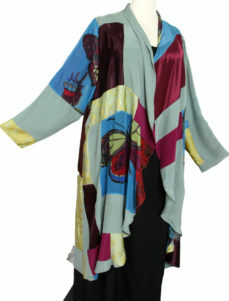 We can make a dress or separates for you as well, your choice of styles in an array of fabrics. Your made-to-order jacket can be shipped in 3 weeks or less. We'll work personally with you to ensure the right size, completing the ensemble with a dress or separates, meeting your deadline. Size XS (14/16) Bust 52 3/4, Hip 55", Length 43", Upper Arm 22 3/4"
Size S (18/20) Bust & Hips 56.5", Length 45.25", Upper Arm 23.75"
Size M (22/24) Bust & Hips 61.5", Length 46" Upper Arm 25"
Size L (26/28) Bust & Hips 64.5", Length 46", Upper Arm 26"
Size 1X (30/32) Bust & Hips 70", Length 46.5", Upper Arm 27.5"
Size 2X (34/36) Bust & Hips 72.5", Length 46.5", Upper Arm 28.5"
All of our garments are easy to alter as they are created from simple styles developed over my 30 year career as a plus size couturier, working directly with clients of all shapes and sizes. Perfect for all figure types. 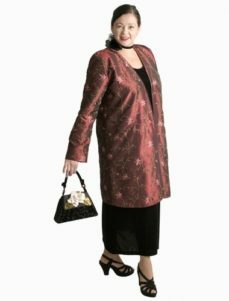 Be the first to review “Kimono Jacket Black Grey Silk Sizes 14-32” Click here to cancel reply.